This adorable family so excited to welcome their second baby (and second baby girl!) to their lives. 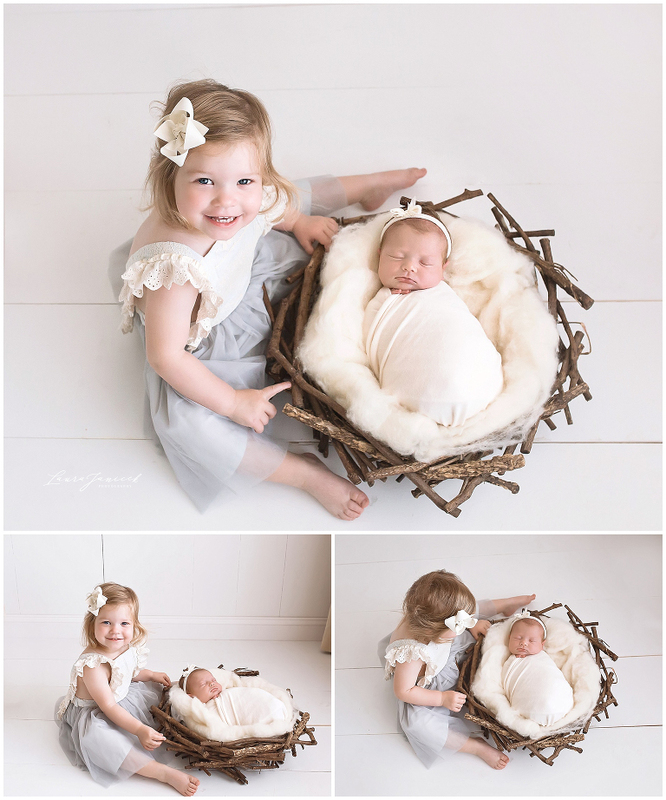 Big sister was excited to participate in this photo shoot with her new sibling. Mom and dad followed my prep instructions perfectly. This preparation before the session really helps baby sleep well through the shoot. 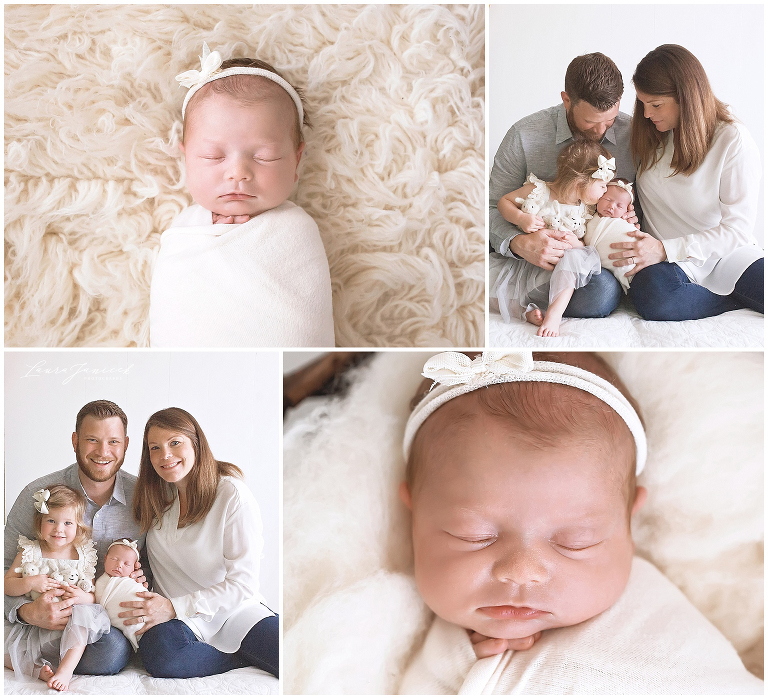 🙂 We were able to capture, not only lots of images of baby on her own, but also a nice variety of sibling, parent and family pictures. 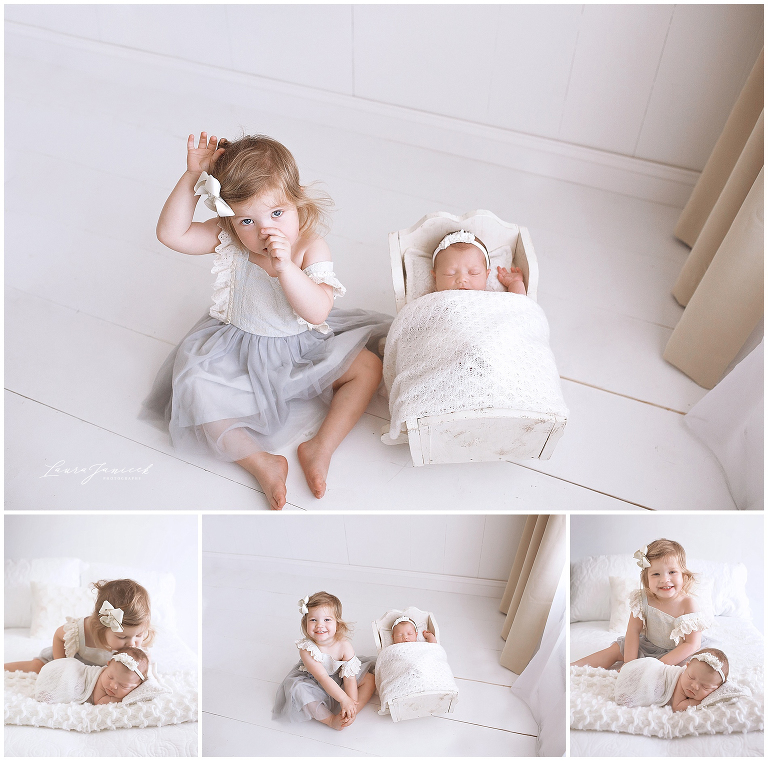 Big sister was so sweet and loving to her new little sidekick during their newborn photography shoot. We never really know how the older child will handle the transition from only child to older sibling. I always try to get a pulse on how big brother/ sister is handling this life change at the start of the session. More often than not, we have a window of cooperation at the start of the session and we definitely try to capitalize on that! While the transition to big sister/ brother can be challenging, I find that the big sibling genuinely loves and cares for the newborn and love to ‘help’ whenever asked. We try to get the sibling pictures finished first while the session is still a novelty. Then we move into family pictures because it’s a nice break to be held by mom and dad. 🙂 The best thing we can do to get the sibling pictures is to not pressure or rush the toddler. I have lots of ideas on how to capture pictures of the two children together, but we definitely need the older child to feel comfortable. Once we get the family and sibling shots done, everyone feels relieved and we can focus on capturing beautiful portraits of your newborn. Parents don’t always want to be in the pictures. There’s a feeling that they want the focus to be on baby and siblings. I totally understand that, but I promise you will want the pictures of your family altogether in the years to come. Your children will want these pictures of you together as well. 😉 I love a nice mixture of posed pictures as well as lifestyle and relationship pictures to fully tell your family’s story at this amazing stage of your lives. Please let me know if you have any questions about my sessions or newborn photography in general. I’m happy to help! 🙂 If you would like to book your session for newborn photography in Franklin, TN or Brentwood, TN, please contact me today!